Does a refinished countertop require special care? A Miracle Method refinished countertop should provide many years of service when given the same care and maintenance recommended by Formica®, Wilsonart®, Corian®, Silestone® and other solid surface countertop manufacturers. Like laminate or solid surfaces, the new finish is not indestructible. 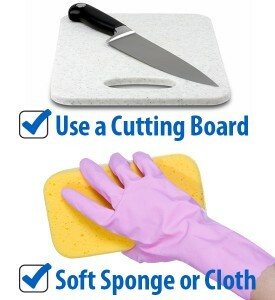 USE A CUTTING BOARD AND ALWAYS PLACE A HOTPAD UNDER HOT POTS AND PANS. Like laminate and solid surface countertops, a refinished surface can also be damaged by knife cuts and hot pans placed on the surface. USE ONLY NON-ABRASIVE, LIQUID CLEANERS, OR MILD SOAP & WATER. Your refinished surface can be easily wiped clean with a damp cloth or non-abrasive sponge, after using general purpose cleaners such as Mr. Clean®, Fantastik®, or Formula 409®. TIP: For best results, spray the surface with a liquid cleaner and wipe it off. Rinse the surface with fresh water and wipe dry.